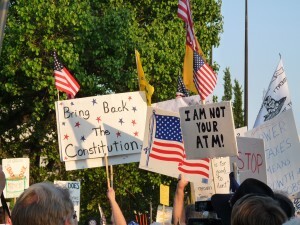 The Five Factions of the Tea Party Movement: Part 1 | Virginia Right! This is the first part in a multi-part series on the Tea Party movement, what it is and the effect the movement is having on all of America. I spent a great deal of time at the Virginia Tea Party Patriots Convention in Richmond, Virginia over the weekend talking to hundreds of people about their views, their feelings and their expectations of the Tea Party movement and was able to easily fit nearly everyone in one of five factions. There is overlap in many cases, but normally no more than one faction away. As this series unfolds, I invite readers to discuss, comment and share their views and will do my best to include your comments and beliefs in the subsequent installments. We will start with the definition of the five factions, discuss each one, and finally the impact on the Republican Party, the Democratic Party and the political arena as a whole. I am a Tea Party supporter and have been from the beginning. My goal is to present an insider’s view of the movement as accurately as possible. It is impossible to characterize the Tea Party, because the movement seems to be all over the place philosophically, yet decidedly conservative. It is especially confusing for liberals and the liberal media who try to pigeonhole the Tea Party movement into some definitive category. And they fail miserably because the members of the movement are far more disparate than the left is able to comprehend. The concept of disparate groups coming together under a single banner is not foreign to the left, as the Democratic Party is made up of many single interest groups – gays, unions, environmentalists, etc. – all united in one party. But this unity, this confederation, is not united in a common goal, rather, they band together to win elections so that their combined power can be used to achieve their individual, special interest goals. The Republican’s are similar to Democrats in that respect. There are a number of special interests banded together to win elections and, thus, achieve their individual goal, be it abortion issues, religious issues or their favorite cause du jour. The Republican Party, however, understands big picture far more than the Democrats and tend to look at ramifications of the enactment of the special interests on the country. Not always, but far more often than the Democrats. For instance, many Democrats favor gay marriage and look only at the question of social justice and equity and not at the potential destruction of the family unit and the long lasting fallout from that. And the same goes for failing to support and fund the prosecution of wars. The implications and ramifications of pulling out before the mission is completed is never contemplated in favor of the short term goal to end the war. Climate change, Cap and Trade and numerous issues also illustrate that Democrats tend to look only at the immediate impact and never the long term. What confounds the left about the Tea Party movement is how different groups with different ideas can unite in a common goal. The only disagreement is on how best to accomplish that goal. In order to understand the Tea Party movement, you must understand not only the common goal, which is to put the Federal Government back in the box the founders of this country intended it be kept, but you must also understand the five basic factions within the movement. The first faction are the left flank of the movement. These are people who once believed the message of hope and change and either voted for Barack Obama or shunned John McCain (and did not vote). They see that they made a mistake and see the Tea Party message of smaller federal government as the right direction. They have come to realize that the world and especially the economy is far more complex than a bumper sticker platitude can explain, and the current administration is unable to deal with the long term consequences of their short term solutions. The second faction are those who were and remain Republicans. They voted for McCain and support the Republican Party. It is no secret that the Tea Party is heavily populated with Republicans who have no interest in reinventing the wheel and plan to fix the Republican Party, or at least do their best to right the ship gone astray. These people are the force behind the new wave of conservatives running for election today and in many cases pushing out the incumbent RINO’s. The third faction are former Republicans that have given up completely on Republicans and support anyone not a Republican who happens to be on the Conservative end of the spectrum. To this group, no Republican could possibly be conservative enough, and even if they were, the Republican Party would simply corrupt the newly elected conservative rendering them RINO’s in short order. This group agrees with a lot of the Libertarian message, but sees the non-fiscal aspects of the Libertarian Platform as too far out. The fourth faction are the Libertarians and similar parties. Their fiscal conservatism and ideas like ending the Federal Reserve System and abolishing the IRS resonate across the Tea Party spectrum, but their social and international policies scare a lot of people. The fifth faction are the unaffiliated right wingers. While they would never vote for Democrats, the Republican Party can’t count on them either. This group has no allegiance to any party and often is concerned with a single issue such as gun control and do not really care so much about the main Tea Party issues of smaller government, lower taxes and accountability. For clarification, these are the people that only care about, or are obsessed with a single issue to the exclusion of all else. Most of the members of all of the factions support these same issues as well as the Tea Party message. It is this groups single focus that sets them apart. This group sees the Tea Party movement as the best vehicle for their cause and is also the easiest for the left wing media to identify with and understand. Much like the philosophy of the Democrats who are not concerned with anything more than their single issue, this group does not object to smaller federal government as government and laws often stand in their way. This faction would contain all of the fringe elements of the Tea Party movement and is the portion of the Tea Party most adored by the liberal media. It is here you would find the most outrageous comments and photos that are the Holy Grail of a liberal media looking to discredit the Tea Party movement. Fortunately, this is by far the smallest faction, but these folks enjoy the attention the media gives their flamboyant and rather outrageous actions. The largest factions are the Second and Third factions followed in numbers by the First and Fourth factions, and the Fifth faction is the smallest. It is impossible to gauge the exact numbers in each of the five factions, and there are a number of people that fit into a couple of groups, at least partially. Tom, I’m not sure where I’d fall in these categories. Next time I see you we’ll have to discuss!